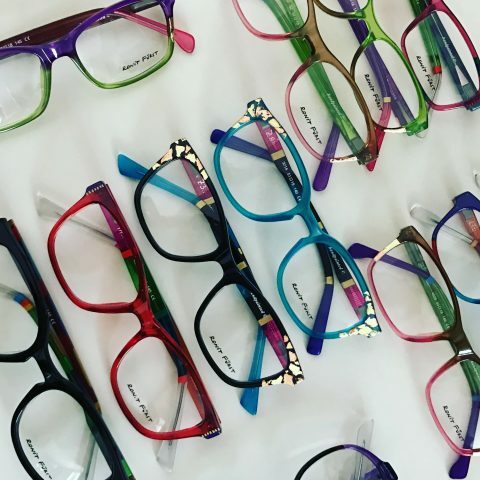 With the near endless amount of frame styles, shapes and sizes, it can be rather daunting to choose a pair of spectacles that do the job as intended, look good and feel comfortable. You want a frame to fit in proportion with the rest of your face – if you have a small face don’t pick large glasses! The correct bridge design for the nose is important for a comfortable fit whether it’s an adjustable nose pad or a fixed type typically used with plastic frames. The lower edge of the frame should not sit on your cheeks and the top edge of the frame should sit similar to your eyebrow position. The width of the frame should be in line with the temporal width of your face. For both optical and aesthetics it’s always best if your eyes sit at the horizontal centre of the lens. Sometimes your eyes may be positioned in the top third of a frame dependent of the lens design needed and the type of frame picked. Try not to pick a frame where your eye position is right in the corner of the frame as this can add weight and thickness to the lens. Square Face: Rectangular frames with rounded edges will soften a square jaw, also look at oval or round frames. Round Face: Angular, rectangular frame styles will help make your face look slimmer and help elongate the appearance of your face. Oval Face: Frames that are thicker or darker on top are a good choice. Avoid narrow, boxy styles. Cool skin tones are best with colours like black, silver, purple, mauve and generally colours which are good for highlighting your features. Avoid washed out colours . There are lots of materials and colours available which will compliment your features. Materials like PVC and Titanium are mostly hypoallergenic. Stainless Steel materials are very strong. Plastic frames can be made with lightweight materials such as carbon and come in a variety of colours. Your optician will help you find a frame that will fit you comfortably, look good and give you THE WOW FACTOR!